In an Old Time Takelma myth, Elder Daldal the Dragonfly rescued his younger brother from a woman who killed people by pushing them into her fire. He said to her, "Do you think you will be a woman? People will call you camas. You will grow in the meadows. You will not be a human being. You will be food." Nowadays she can be seen blooming in the meadows along the Rogue River. Up north in the Willamette Valley, less than 1000 acres of historical wetland prairie exists today. Prior to the arrival of Europeans, these prairies covered one-third of the Willamette Valley -- 400,000 acres. And this number doesn't include the rest of western Oregon! Camas has been an important food source for Oregon Indians for centuries. Each year in late summer, camas prairies were managed with low intensity burning when the meadows were dry and the seeds released into the soil. This practice encouraged the growth of camas and pretty much eliminated competing vegetation. In 1994, the Willamette National Forest acquired 14 acres of ranch land. Years of overgrazing and the introduction and flourishing of invasive weeds and trees had decimated what had once been a rich and healthy wetland. Thus began the Camas Prairie Restoration Project. Since then, Camas Prairie has been burned every two years and, for the past decade, camas seeds have been collected annually. Camas plants have tripled in number, and invasive weeds have decreased by half. Back in my neck of the woods, several forest and meadow restoration projects are in the works, including the Vesper Meadow Restoration Project outside of Ashland, once a major camas field for native people. What Indians have known and practiced for centuries still works! Thinking back to the past couple of fire-crazy summers, I believe that incorporating more native environmental practices into current forest management plans is a wise move. Some has been done, but not enough! Low intensity burning can reduce fuels built-up in the forests from years of neglect, and lower the risk of catastrophic wildfires. And bring back the camas! 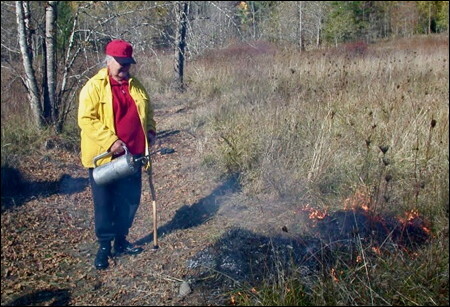 The images show Takelma elder Agnes Baker Pilgrim lighting a prescribed burn at Camas Prairie in 1994 and a few lines from J.P. Harrington's field notes identifying Vesper Meadow as a camas place. The field notes also contain maps and more detailed descriptions. Grandma Aggie's parents and brother visited Vesper Meadow with Harrington on November 16, 1933.